Imagine a superfast, near silent sports car, cruising the neon-lit streets of an after-dark London. This is the compelling image that gave birth to INFINITI EMERG-E, and this concept is its realization. INFINITI EMERG-E is a highly advanced, mid-ship, electric motors powered sports car concept. It projects Infiniti’s already advanced electric vehicle technology deep into the future with a range-extender powertrain that delivers the performance expected of sports car bearing the Infiniti badge. Combining thrilling performance with the scope to drive in urban conditions for up to 30 miles with zero emissions, it emits no more than 55g/km of CO2 (NEDC cycle) over a 300 mile combined range. INFINITI EMERG-E lays down a radical new marker for mid-ship sports cars, and explores one of a number of the alternative propulsion avenues that Infiniti is considering. The thinking that brought the INFINITI EMERG-E concept about came from the department of Francois Bancon, Division General Manager of Exploratory and Advanced Product. “When I was in charge of exploring the next step, I thought, how can we be innovative? We started with Essence. It was very successful, but arguably not a dynamic performance flagship. Then came ETHEREA, an indication of Infiniti’s future in the compact luxury segment. Now we have to think about a flagship, an emblem for the brand – not necessarily a big car, a limousine, because Infiniti is about inspired performance, and sporty cars,” said Bancon. Creating a sporty, dynamic and unusual flagship is one inspiration for the INFINITI EMERG-E program, but equally important is Infiniti’s continued exploration of alternative propulsion systems, a logical next-step for a company that is already selling the advanced Infiniti M35 Hybrid. That exploration takes an unusual form with INFINITI EMERG-E, its range-extender driveline a first for Infiniti. INFINITI EMERG-E also represents a new way of developing cars for Infiniti. It is the first car developed in Europe, and the first car it has built as part of a UK government sponsored technology initiative. That initiative is run by the Technology Strategy board, whose aim is to fast track the arrival of low carbon cars to the UK’s roads. The TSB’s competition is framed to encourage contact with innovative and pioneering suppliers who might not normally gain access to major manufacturers, providing Infiniti with the opportunity to harness promising new technologies that might enable it to produce better low carbon cars. That projects like INFINITI EMERG-E only qualify for partial funding if they pioneer new technologies – which this Infiniti clearly does – also encourages innovation. “This is a new way of thinking about the sports car of the future,” said Bancon. 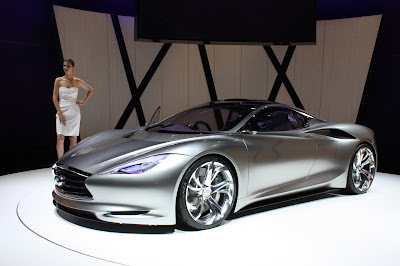 INFINITI EMERG-E was designed under the direction of Senior Vice President and Chief Creative Officer Shiro Nakamura. While some of Nissan Global design bases were involved in this project, the overall design development were mainly led by Nissan Design Europe (NDE), Paddington, London, and built by Nissan’s European Technical Centre (NTCE), Cranfield. It’s a highly significant car for Infiniti because it advances on many fronts. It is the first mid-ship sports car the marque has ever produced. It takes the Infiniti design vocabulary in a fresh, intriguing and convincing new direction. It stretches Infiniti’s already accomplished expertise in the areas of electric vehicles and alternative propulsion systems. And it will provoke debate about the form an Infiniti flagship should take. INFINITI EMERG-E is also unusual for being a project part-funded by the UK Government’s Technology Strategy board, a development that has significantly deepened the resource that the brand can draw on for the creation of new models, while lending this project an intriguingly international flavor. The desire to stretch Infiniti’s knowledge of electric vehicles lead to the idea of a range-extender electric vehicle, and just such a machine began to be developed in Japan. An unexpected opportunity to advance the project through Britain’s Technology Strategy Board (TSB) – whose mission is to speed the passage of low carbon vehicles to UK roads – provided the chance to access new technologies and work with a variety of organizations. These included universities, suppliers and OEMs, this facet of the development broadening the scope and ambition of INFINITI EMERG-E. The opportunity to work in a consortium revealed that fellow member Lotus Engineering was also developing a range-extender electric sports car, the two companies deciding that it made sense to collaborate. That decision, explained Bancon, was eased by the fact that “Nissan (and Infiniti) have had a relationship with Lotus for 10 years, mostly about methodology. We have never agreed a contract to do a car with Lotus, but we have done many studies together, utilizing their additional resource when ours was taken,” he said. Further benefits included co-funding of the INFINITI EMERG-E project from the TSB, and access to a range of highly innovative suppliers. A key feature of the INFINITI EMERG-E Concept is that it contains a blend of technologies and solutions that have not previously been tried, as required by the TSB funding rules. The sharing of several components by other members of the consortium is also an element of the TSB initiative, the aim being to promote developmental economies of scale, although the approach to their deployment differs. That chance will gain extra momentum when Infiniti produces two fully functioning INFINITI EMERG-E demonstrators in the next step of this highly unusual and innovative concept development program. Although Infiniti has only been on sale in Europe since 2008, the brand made a big impact when it was launched in the U.S. in 1989 as Nissan’s luxury marque. From the very beginning the Infiniti name has symbolized “Inspired Performance,” the ownership experience painstakingly tailored to combine these qualities with exceptional customer care. Those first two decades culminated with the 2009 unveiling of the Essence, an elegantly sensuous-looking high-performance coupe. Apart from making a very favorable impact that resonates to this day, Essence was the first of a trilogy of concept cars showcasing the three core strands that characterize Infiniti’s design values. The second concept was ETHEREA, and INFINITI EMERG-E is the third. This dramatic trilogy of show cars embodies the three strands that form the foundation of Infiniti’s Design Values. The elegantly spare muscularity of their bodywork is inspired by the Energetic Force to be found in nature. Their Seductive Aura is also immediately apparent, from the sensuous, hourglass squeeze of Essence’s cockpit to the graceful, unbroken arching of Etherea’s roofline and the subtle, cloth-like folds of INFINITI EMERG-E’s haunches. Yet the drama in the lines of all three show cars is tempered by the qualities of Dignified Intelligence that suffuses all Infinitis. The concepts also bear a unique set of highly individual hallmarks that characterize an Infiniti. These include a radiator grille elegantly book-ended by a double arch and Infiniti’s highly distinctive crescent-cut rear pillar. Just as distinctive are the headlights, which are redolent of the eyes of a human, this shape reinforced by a fine eyebrow line of LEDs. INFINITI EMERG-E takes the brand’s design vocabulary in an exciting new direction, this being the first time that it has been applied to a mid-ship sports car. That experience began with the creation of three-quarter scale model proposals from Infiniti studios in Japan, the UK and California. The winning design, the work of California-based Infiniti designer Randy Rodriguez, was recreated as a full-size clay model constructed at Nissan Design Europe’s Paddington studio. The aim has been to combine the brand’s characteristic long nose with the heavier volume at the rear, while maintaining what Nakamura calls “the emotional flow of an Infiniti.” Unlike most mid-engined cars, INFINITI EMERG-E is not a wedged design, although there is considerable energy in its shape. Taisuke Nakamura, NDE Design Manager, explains that, “The volume of INFINITI EMERG-E starts from the badge and the grille and flows like a stream from here all the way to the chopped tail.” This fluency of line is all the more effective for the extra length grafted into the INFINITI EMERG-E platform ahead of the windscreen, the fast angle of its A-pillars and the subtly flexing curve in the upper surfaces of INFINITI EMERG-E’s flanks, a characteristic of every Infiniti. So is the crescent-cut sculpting of the car’s rear pillar – fast-becoming a key Infiniti signature – which gives INFINITI EMERG-E a distinctively shaped greenhouse. The furl of the neck of a Kimono is the inspiration for INFINITI EMERG-E’s subtly voluptuous lateral air intakes, explained Nakamura, adding that he did not want to see the crude grille of an air intake. Bold headlights also identify INFINITI EMERG-E, their crescent-shaped LED illuminations visible during day and night. It is a future Infiniti design cue that was first shown on the ETHEREA concept. The penetrating quality of these lamps and their eyebrows is suggestive of human insight, a product of Infiniti’s Dignified Intelligence approach. The double arch grille also resonates with the flowing shape of the INFINITI EMERG-E’s shapely rear wings. The crowning visual highlight is the dramatic liquid silver paint that envelops this leanly tensioned, low, wide and more masculine Infiniti. Underlining the theme of Energetic Force, this liquid metal paint emphasizes the INFINITI EMERG-E’s sculptural, fluid lines. The EVO motor design offers a range of weight, volume, efficiency, control, and manufacturing advantages, and is characterised by extremely high power and torque densities. The low-weight and small footprint of the Axial Flux machines enable electric-drive vehicle manufacturers such as Lotus and Infiniti to develop lighter, smaller and more efficient hybrid and electric propulsion systems. The motors direct their power via a single speed Xtrac transmission (4.588:1 reduction box) to create what is effectively an open differential, this arrangement significantly reducing driveline friction losses. A quartet of inverters controls the motors and their energy regeneration role under braking, the recovered power being directed to a lithium-ion battery mounted behind the seats. The lithium-ion phosphate battery pack can be recharged from the grid (domestic and fast-charge) and stores sufficient energy (14.8 kWh) to propel the EMERG-E for 30 urban miles, at which point the on-board gasoline engine starts up to act as a generator. Recharge time from 13 amps takes 10 hours, or 6 hours at 16 amps. This light, ultra-compact, Lotus Engineered three-cylinder 1.2 liter 35kW engine has been purpose-designed for its range-extending role. It operates between crank speeds of 1500-4000 rpm, producing peak power at only 3500 rpm. The EMERG-E high performance, low-emission propulsion system is installed within a lightweight, extruded aluminium chassis unit to which ultra-light carbon fibre panels are attached. Infiniti is keen to explore the potential for this material in future low production volume models, given that it provides a 20% strength-gain in tandem with a 50% reduction in weight. EMERG-E has been developed for aerodynamic performance, both to reduce energy-draining drag—which stands at 0.34—and to generate positive downforce, and downforce balance, to enhance its high-speed handling. EMERG-E features the double wishbone suspension of race-car practice, its arms of aluminium to save weight. Its carbon fibre panels have been developed in the UK in conjunction with a number of leading motorsport specialists (Lola Composites, supported by Cranfield University), with the aim of using the material in higher volumes than has previously been possible. The cocooning cockpit of a sports car, the artful grace of craftsmanship, the intrigue of experiencing an innovative machine – all these qualities and more are to be found inside INFINITI EMERG-E.
INFINITI EMERG-E is a strict two-seater sports car, and it provides the classic reclined seating position that heightens the driver’s sense of connection to car and road below. The cockpit is clearly oriented around the driver, and as with all the best sports cars, its simplified controls are located for speedy and intuitive use, this more mechanical, functional look reinforcing the theme of inspired performance. Yet the overwhelming impression is of the flowing lines of this cabin’s highly distinctive architecture, their contrast with its high-precision cut lines and the elegantly executed attention to detail. The swooping lines of Infiniti’s trademark double-wave dashboard structure, a lightweight, floating center console and the inviting textures of locally sourced, semi-aniline leather upholstery make this a sports car cockpit with a difference, especially in the detail, and the dark chrome center console finisher echoes the crescent cut signature in the car’s rear pillars. But the most dramatic detail appears when INFINITI EMERG-E is powered up, bursts of light briefly streaking around the cabin to provide live confirmation that the EMERG-E is ready for action. This lighting is an essential part of the INFINITI EMERG-E experience, not only because it confirms the electric heart of the car, but also because it provides a striking, modern alternative to the conventional roar of an internal combustion engine. The lighting sequence signals the flow of energy within the car, a heartbeat signature radiating from the ignition to illuminate the floating centre console and the silhouettes of the seats. A small, jewel-like lamp in the steering wheel boss also lights up momentarily to reinforce the drama. After three seconds these illuminations fade out, leaving the eye free to concentrate on the excitement of driving INFINITI EMERG-E. Among the finer details is the dramatic undercut of the dashboard ahead of the passenger, a sculptural device that doubles as an air vent. The line of this cut runs in a single, energetic swoop into a center console whose lightweight, carbon fiber construction makes a satisfying reminder that the entire outer structure of the car is made from the same material. The center console’s upper surface is angled to present the INFINITI EMERG-E’s transmission controls to the driver, who sits behind a finely detailed instrument pack that includes a gauge indicating the percentage of total available power. The instrument illumination mostly glows blue, but shades to hot purple when INFINITI EMERG-E is driven with vigor. The excitement of the drive is further heightened by a neatly integrated, touch-screen display, a wheel whose upper and lower portions are flattened off, and a light in the center of the boss that illuminates when the car is deploying full power. A pair of slender, lightweight, luxuriantly supportive bucket seats provide grippy Alcantara® side bolsters and leather centre panels, the fine stitching of this upholstery confirming Infiniti’s painstaking mastery of interior detail. The inviting nature of the interior is a reflection of Japanese hospitality, while the influences of traditional craftsmanship can be seen in the slightly shiny texture of the semi-aniline leather encasing the dashboard and seats, the subtle violet-tinted lacquer sheathing the cabin’s carbon fiber elements and INFINITI EMERG-E’s novel flooring. Fashioned from an architectural material called Sefar, this fine metallic mesh allows light to shine through to provide an intriguing, translucent glow. “It’s the first time this material has been used in an automotive application,” said Gail Patrick, Senior Color Designer, adding, “it adds depth and allure,” while underlining the car fact that this car is electrically propelled.